Pomp and circumstance from the age of the Roman empire Rozsa captures the essence of chariots, triumphal processions, and intendant battles with this music from the great 1959 film by William Wyler. 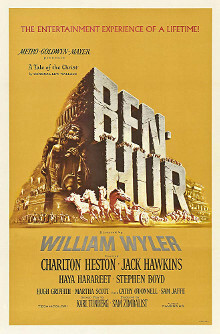 Available seperately from the film are: "Love Theme," "Prelude," and "Rowing of the Galley Slaves," all for orchestra. And keep in mind the 20-minute suite for orchestra from the film "Quo Vadis."